A small capital ship, the Munifescent class vessel played many roles in the CIS fleet. A gunship by doctrine, its heavy firepower was brought to bear at the expense of more powerful shield generators, though its armor protection was superior to some of the more lightly defended vessels of the day. However, the Munifescent truly came to the fore in larger fleet battles, where its jammers disrupted the enemy fleet's communications, causing singificant problems to command and control. 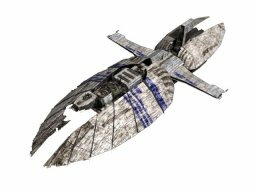 One of the few CIS ships without significant fighter coverage, the Munifescent ships were rarely found alone, instead concentrated in the larger squadrons deployed by General Greivous on the Outer Rim.